← Hiking in Big Sur and Pfeiffer Beach! THE MAJESTY OF NATURE. 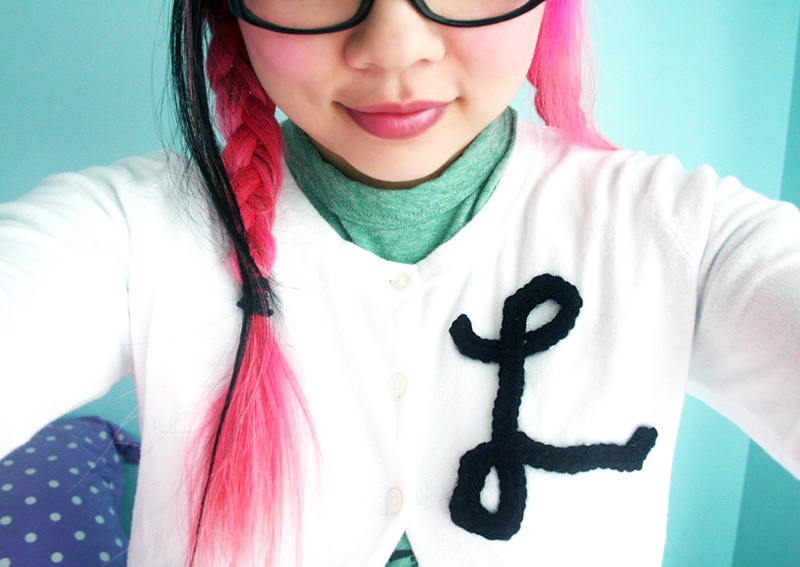 How to crochet a Laverne patch for your cardigan + Hot Fabric Glue Experiment: We’re gonna do it OUR WAY, YES, OUR WAY! 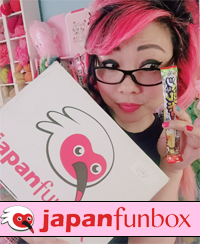 Wow, today’s post is like a triple whammy!!!! 1) Free crochet pattern 2) Experimenting with a new fabric glue 3) Pimping out 2 cool Etsy shops. Let’s go! 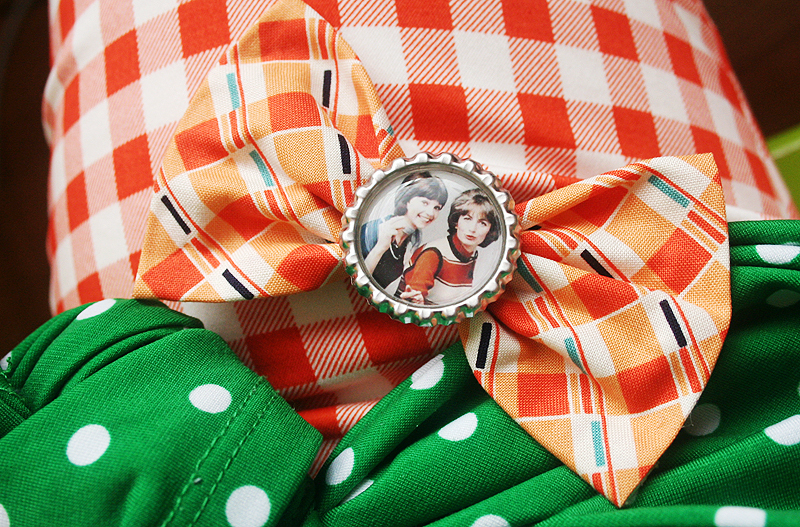 So if you couldn’t tell from the blog title, today’s post is all inspired by LAVERNE & SHIRLEY. The younguns may not remember this, but us olduns do! It’s the funniest, goofiest, BFF TV show! 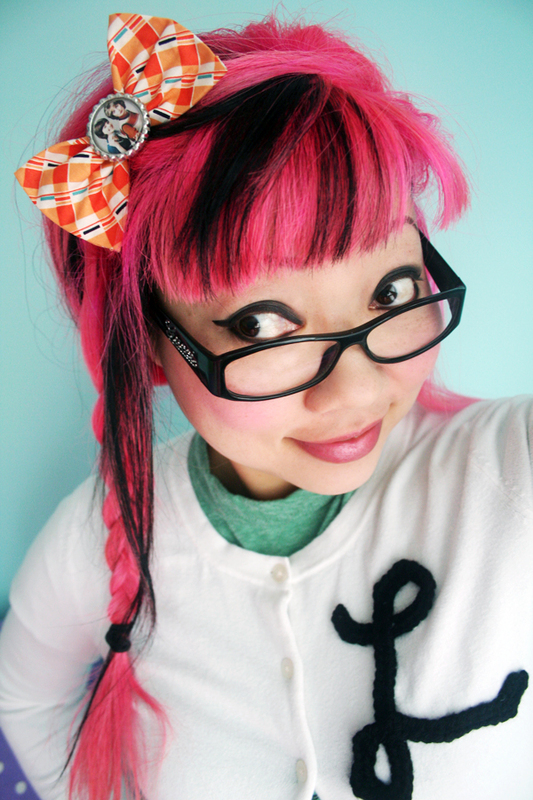 Joy from Lucky Cupcake Hair Clips sent me this amazing Laverne & Shirley hair bow, and I scrambled to think of what outfit I could put together to do it any amount of justice. I don’t have a lot of Laverne-y pieces in my closet (YET), so I sort of improvised … by making my own Laverne-inspired cardigan! To create the “L” for my Laverne cardigan, I used Norma Lynn’s “Love in Cursive” crochet pattern for inspiration. You should grab her pattern to spell out the whole word! Here’s what I busted out for the Laverne “L” : ch 71, sk 1st ch, 2 sc, (2 sc), 10 sc, (2 sc), 2 sc, (2 sc), 2 sc, (2 sc), 18 sc, sc3tog, 2 sc, sc3tog, 2 sc, sc3tog, 2 sc, sc3tog, 10 sc, (2 sc), 3 sc. 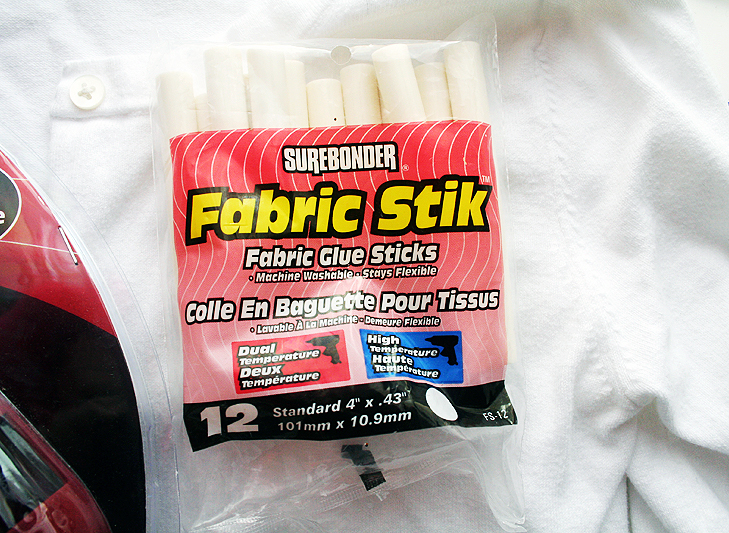 Then, I experimented with Surebonder Fabric Stix: hot glue for fabric! That’s flexible! And washable! I can’t vouch yet for how it washes. Only time will tell. I was just excited to try this out. It kinda stinks that it’s white and not clear, but for this project, it was fine. It also, kind of literally stinks. It’s a bit smellier than regular hot glue, so you might want to pop open a window if you’re afraid of chemical smells. It’s no way near as bad as E6000, though. Ultimately, I think that hot fabric glue is an easy solution for some quick embellishments, but since it’s GLUE, it is kinda bulky and not as delicate as hand-sewing. Here’s an action-packed video I made while using the Fabric Stix for the first time! I would say that it is certainly a quick n convenient way to glue stuff to other stuff, but I felt like I was being too messy with it, and it was kinda stringy, and……..it’s WHITE. So, there are some definite down sounds to working with it. I’m interested in how it would hold up to gluing bows to jeans and stuff like that. More experimentation later! 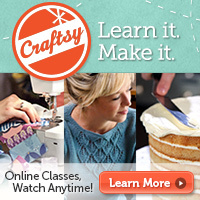 This entry was posted in Crochet, Patterns & How-To's, What I Wore Today and tagged free pattern. Bookmark the permalink. 11 Responses to How to crochet a Laverne patch for your cardigan + Hot Fabric Glue Experiment: We’re gonna do it OUR WAY, YES, OUR WAY! Oh weird, I’ve never heard of fabric hot glue! I’ve been meaning to experiment with fabric glue myself (gluing small parts to robot amigurumi), but maybe this stuff wouldn’t be good for small beads and such. Thank you for the review! YEah there are lots of different fabric glues for all sorts of different things! This is so SO great! I got on youtube first thing this morning and your vid was the first thing in my feed! Could you please tell me what “sk” means? UMMM the worst part of that is how many people in their 20s and under have no idea what Laverne & Shirley is!!!! I am going to make so many and monogram so many things, LOL. I absolutely remember Lavern & Shirley, an of course Happy Days! Thanks for a retro style craft TC!